Domaine de la Yole is a large, fun and lively 5 star campsite that lies a short distance from the beautiful Mediterranean coastline. One of the premier campsites in the area, Domaine de la Yole boasts an eye-watering number of activities meaning you’ll never be bored. The campsite is very large and set within a wine estate that totals around 110 hectares. Some of the activities include wine tasting and tours, a farm with a variety of animals for children to pet and a high rope adventure trail. Although there’s enough on-site to keep you busy for your entire holiday, Domaine de la Yole also provides the perfect base from which you can explore the south of France. There are a whole range of activities and places to see and visit nearby including the stunning Carcassonne, Perpignan and Montpellier. If all of this isn’t enough, then you’ll be pleased to know that there’s a stunning beach just 400 metres away. Covered in lovely soft, golden sand, the beach is the perfect place for a family day out. Play in the sand, sit and sunbathe or splash around in the warm Mediterranean sea, the choice is yours. Finally for those looking for a campsite with a great swimming pool complex, look no further. Domaine de la Yole boasts 3 swimming pools, a variety of slides, a lazy river, sauna, spa and jacuzzi, all of which will guarantee that all members of your family will have fun here. 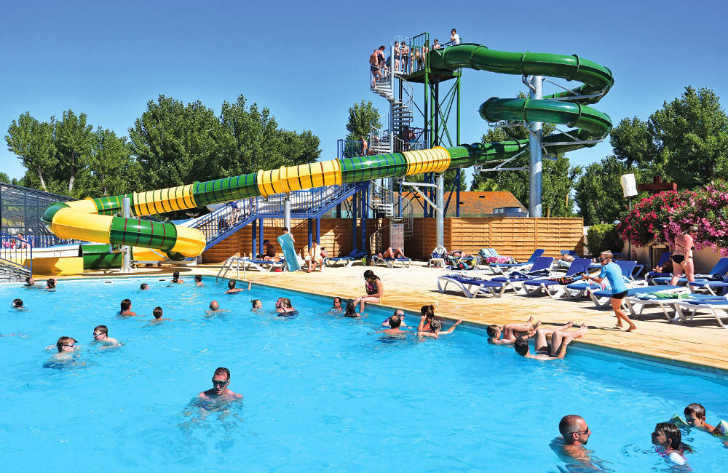 Domaine de la Yole campsite offers a comprehensive selection of activities and facilities on site and also nearby to ensure you have a fantastic family holiday. On-site activities at Domaine de la Yole campsite include table tennis, tennis, football, volleyball, basketball, archery, mini golf, farm, winery, adventure trail, fitness classes, boules, trampolines, playground and cycle hire. Facilities available at Domaine de la Yole campsite include WIFI, restaurant, takeaway, bar, groceries, wine shop, gift shop, games room, tv room, animation team, washers and dryers. Accommodation at Domaine de la Yole campsite includes a range of 2 and 3 bedroom mobile homes that are available from Eurocamp.